With the summer weather still holding on there has been lots of bike riding in the last few weeks. 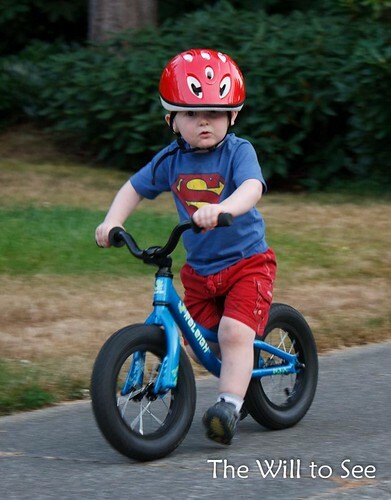 Will is getting very good on his balance bike (a little bike with no pedals.) He has even started to lift his feet up and actually glide a bit. Of course you have to make motor boat sounds while you are riding; it must make the bike go faster. Thank you for taking the time to put this web site together. My 11 year old son also has Ocular Albinism. We live in South Seattle. He looks so cute all decked out like that! It has been awhile since my daughter was that age and I think back then they did not have helmets for them to protect their heads so riding a bike was nerve racking! I am a new follower from the blog hop and following you thru RSS Reader, Facebook and Twitter. I would love a follow back on all three of those also when you get the chance. Thanks so much for your help and have a great day!